According to a federally sponsored study (the NHANES III analysis), these are three of the most popular foods that kids aged 6-11 eat at snack time. On the left is a bottle of Coke – the most popular. In the middle are jellybeans, which came fourth on the list under the category “non-chocolate candy”. On the very right are some cookies, which made number three on the list. Unfortunately, these snacks are RUINING your children’s health because they each contain 3 deadly ingredients that when consumed too much, can result in obesity, brittle bones, ADHD and even diabetes! That’s not a typo above – I call these SINgredients because there’s no good associated with them! You’ve also got to be on your toes because sugar has various disguises, such as fructose, high fructose corn-syrup, glucose and more. If you want to give your kids the best start in life, there’s no question that you need to limit the amount of sugar they eat. The frustrating thing is figuring out what to do when your kids already have an overdeveloped sweet tooth and beg, cry and whine for sweet treats? All 3 of these popular snacks contain artificial colors and/or flavors. Everyday, studies are showing that many chemicals that we once thought were safe actually aren’t. In fact, just a couple of years ago, you might have heard the story about a common chemical used to manufacture plastic water bottles, children’s toys, baby bottles, and more, Bisphenol-A (BPA), actually mimicked the human hormone estrogen! This chemical was linked to various health problems, such as breast cancer cell growth in women, decreased sperm count in men, and brain and hormone development problems in fetuses and young children. In 2010, this led Canada to be the first country to declare the chemical BPA toxic, with other countries soon following suit. Most baked snack foods have trans fats or some other type of unhealthy, processed fat, such as vegetable shortening, margarine, canola oil, soy oil, and modified palm oil, to name a few. These corporations aren’t concerned about your health, they’re only concerned about making more profit! Trans fats have been found built-up in your arteries, which is what causes atherosclerosis (hardening of the arteries) and contributes to high blood pressure and heart disease. Now, if your kids eat these snacks, you might be feeling pretty upset right now. But don’t be upset at yourself because it’s not your fault. Sorry, but Trix are NOT for kids! You see, the big food corporations spend millions of dollars in advertising these foods to kids, picking the times when they’re glued to the television, and associating their foods with cartoon characters or movies that they love… All to get the kids to nag their parents for these foods. And if you’re not giving these to your kids, some other kid probably is! Worst of all, some of the shadiest corporations actually try to pass these foods off as healthy. Often times it works because they’ll get some “seal of approval” or “certification” or by using buzz words like “whole-grain”. Sometimes they’ll even make up their own seals or buzz words! Well, I’m sick of the lies and misinformation and I’m here to help you make better choices for you and your family. My name is Helen, and I’m also known as “The Dessert Angel”. I’m not a trained chef or cook, I’m just a regular woman like you. So I searched and experimented until I found some healthy snack recipes that could satisfy my sweet-tooth cravings, without sabotaging my diet. It took a lot of trial and error, failed recipes, but I finally came up with a few that I not only loved, but would also help me get lean. I had fun in the kitchen and my hubby didn’t mind being my taste tester, so I kept experimenting. I came up with a bunch of new recipes and tweaked old ones, and friends kept asking me for my recipes. So I put them together in a book for other women like me who wanted to satisfy their cravings without sabotaging their diet that called “The Dessert Angel’s Heavenly Recipes Guide”. Our friends loved the brownies, but what was more exciting was that their KIDS LOVED THE BROWNIES TOO! They didn’t even know that they were “healthy”, nor did they care! It was then that I knew I had to share this with all the parents who are struggling to get their kids to eat healthy foods and limit the amount of junk foods they eat, which is why you’re here today. It’s a collection of the very best healthy dessert recipes I’ve created that will help you satisfy your cravings without sabotaging your diet and help your kids eat healthy foods they’ve never eaten before. These Are Pictures Of The Actual Desserts You’ll Soon Be Enjoying! There are 42 recipes for decadent desserts in this guide to keep you coming back for more. And more. And MORE! 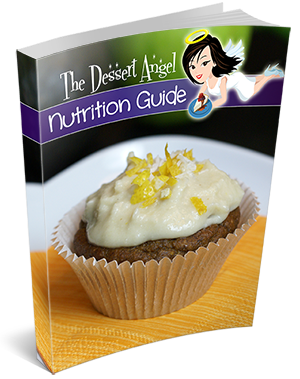 After discovering the easy, delicious and healthy recipes in the Dessert Angel’s Heavenly Recipe Guide and the simple, practical tips inside the Guide to Losing Weight and Keeping It Off, you and your family will love eating treats that you won’t even know are healthy. You don’t have to waste hours and hours researching and trying out recipes and wasting ingredients in the process. I’ve done all of that for you already. 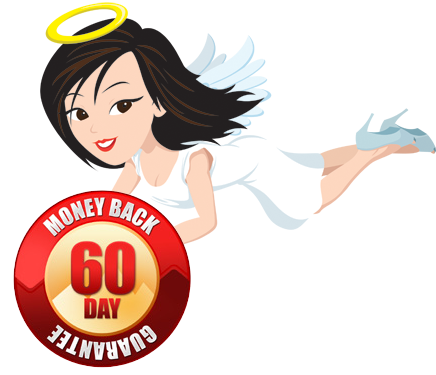 Because you’re here and I want to get these recipes into the hands of as many Mom’s as possible, I’m going to offer you a special discount. your kids will eat and actually enjoy? Are you frustrated looking for healthy foods to please the fussy eaters in your house? Do you sometimes feel guilty letting your kids have junk food, but don’t know of a healthy alternative? 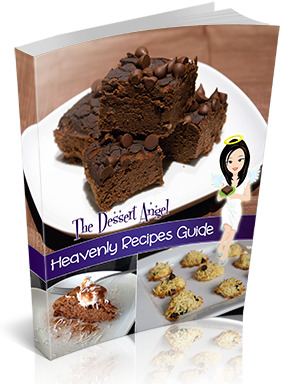 Well now you can get rid of the trouble, frustration and guilt by whipping up the easy and delicious treats in “The Dessert Angel’s Heavenly Recipe Guide”. The desserts are all “angel approved” and have no refined sugar, white flour, processed fats, or any other unhealthy SINgredient that will harm your health and the health of your kids. 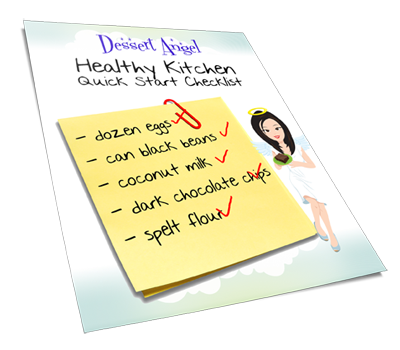 After discovering the easy, delicious and healthy recipes in the Dessert Angel’s Heavenly Recipe Guide, you’ll finally have the ability to satisfy the sweet tooths in your home, without feeling guilty about it. You don’t have to waste hours and hours researching and trying out recipes that may not actually be healthy. Before creating these recipes, I spent a lot of time researching and experimenting with so-called healthy dessert recipes that weren’t actually healthy at all! I know you’re busy and you don’t have that kind of time to waste. That’s why I’ve done all the work for you and have tested and tweaked these recipes to make sure they’re lip-smackin’ good and healthy as can be. If, after taking a bite out of a Dessert Angel recipe, you or your kids don’t struggle to keep crumbs from spilling out of your mouth because of the involuntary smile that will occur knowing you can satisfy your cravings without sabotaging your diet, send me an email and you’ll receive a full, 100% percent money-back refund of every penny you paid. I’m doing this because I want to remove any and all barriers that might stop you from discovering these delicious, simple and slimming recipes so you can give it taste test with no risk. I look forward to helping you and your family snack healthy while enjoying every bite! Q: Are the desserts gluten free? A: 35 of the 42 recipes are gluten free desserts included so you’re sure to find more than a few that you love. In case you were wondering, 26 are dairy-free and 16 are nut-free.